Brittany and her husband saw this at Cracker Barrel. 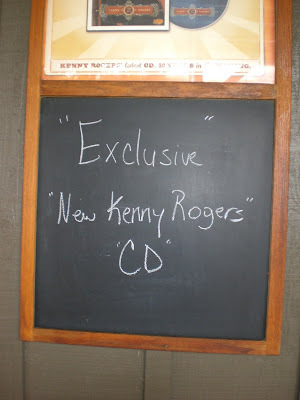 I guess you can get old LPs from a Kenny Rogers imitator? Imitator, or it's just a biting criticism about Kenny's new fake "face." I think he and Dolly are "Islands in the Stream" because they will both float in water now. Maybe they're Kenny Rogers Certificates of Deposit. That kind of CD. Oh hahahaha!! I'm laughing because I saw that very same sign but don't own a digital camera! I would have taken a picture and sent to you...I'm so glad someone else did! !